PUBG Mobile is one of the world’s most trending games which feature 100 players playing at the same time in one match. Player’s Unknown Battleground Mobile version was launched on 9th February 2018. The game has many updates and till the time it has completed 4 complete seasons while the current season is running and season 6 will start from 19th March 2019. Tencent officially has announced its emulator Gaming Buddy through which you can play PUBG Mobile on your PC. Tencent’s Gaming Buddy has some decent system requirements which can be easily found for many PC users but for some users who don’t exactly have those minimum requirements to run Tencent’s Gaming Buddy can also play PUBG Mobile on PC. CPU: Dual-core from Intel or AMD with a clock speed 1.8 GHz. The game is full with a lot of features and since it is for mobile it is tremendously great but there are some reasons because of which you are unable to play PUBG Mobile on your PC. Tencent’s Gaming Buddy settings are more important when playing in low-end PC because they come up with default settings which may not suit your PC. Here are the settings explained in depth so that you can play PUBG Mobile using Tencent’s Gaming Buddy. There are five options for rendering, and every option has a different rendering engine. Rendering options basically depend upon the operating system you use. OpenGL and OpenGL+ (recommended) are basically for Linux users and DirectX and DirectX+ is used in Windows. So, if you use Windows operating system then you must select DirectX or DirectX+ and if you use Linux operating system then you should select OpenGL or OpenGL+. But OpenGL is considered to be more powerful when is used in either Linux or in Windows. So if you are using Windows then you must switch between OpenGL and DirectX+. Smart Mode selects automatically according to your PC but it’s better than you only select the one which is suitable for your PC. Smart Mode is sometimes responsible for the lag of your game because switching between modes in low-end PC requires more memory that’s why it’s recommended not to use Smart Mode. Rendering Cache must be checked as cashed data rendering reduces your internet data usage but this option can also cause some sort of shuttering so you must try both checking and un-checking the option as this depends completely upon your hardware. This option must be checked only if you have a decent Graphics Card that is it must be at least Geforce GTX series and Radeon RX series. If you have HD Gaming Graphic card then only you should select this option else un-check this option. Prioritizing Dedicated GPU can load up your graphics card with a bundle of graphics which it may not handle. 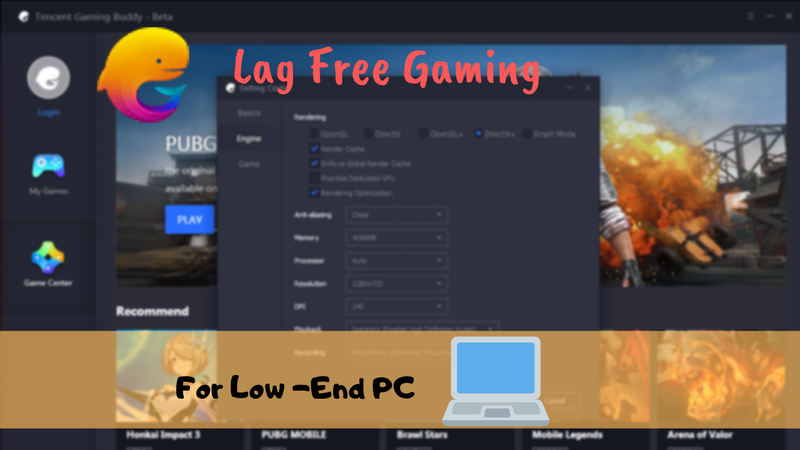 I recommend to un-check this option to achieve no lag situation. Anti-aliasing obviously makes graphics look smooth and mixes the edge to diminish the sharpened area. Anti-aliasing reduces the graphics to appear suddenly like those trees far behind the scene can appear once in a sudden or can smoothly appear. So, the smooth appearing is done by anti-aliasing. Turning it off will lower the burden on your graphics card which eventually will enhance the game performance. If you have less than 2GB graphics card then it is strictly recommended to close anti-aliasing both from Tencent Gaming Buddy and the in-game settings. And if you have graphics card around 4GB or greater then you can select Balanced or Ultimate but for low-end PC you just have to close anti-aliasing. If you have Intel i3 or Pentium then you must always select 2 processors and for PC having Intel i5 you can set it to auto because auto mode will adjust processors itself. The main login is to set the processors to half the logical processors in your PC. But if you want your processor to be at maximum usage you can set it to 4 processors for Intel i3. But at max 2 processor setting is recommended for any lag issues. This is the unit for mouse sensitivity in Tencent Gaming Buddy. Maximum it’s density the better sensitive your mouse is. DPI can also cause lag to the game because it requires those little mouse sensitivity measurements which at sometimes requires more calculations and ultimately can cause an unwanted lag in your game. If you have a gaming mouse then you might be aware of its DPI at which it can run. And if you are using any normal mouse like me then you select 160 or 240 DPI which is less in comparison with gaming mouse. For Low-End PCs it is recommended to put your resolution to SD 720p resolution until you are carrying at least 4 GB good graphics card and if your monitor support so. As it is recommended by Tencent, you can select 1080p HD graphics for GTX 660 and 2K HD graphics for GTX 1060. This is the key point which is the major issue for game lag. The default display quality is set to ‘balanced’ but this most of times creates an issue as less automation in low-end PC generates smooth results. So we will keep this setting to ‘Smooth’ which will obviously make your game more smooth and less laggy.